Well, the camera itself isn't exactly new. But the Juno orbiter containing it just arrived at Jupiter earlier today (US EDT) after a nearly five-year journey. 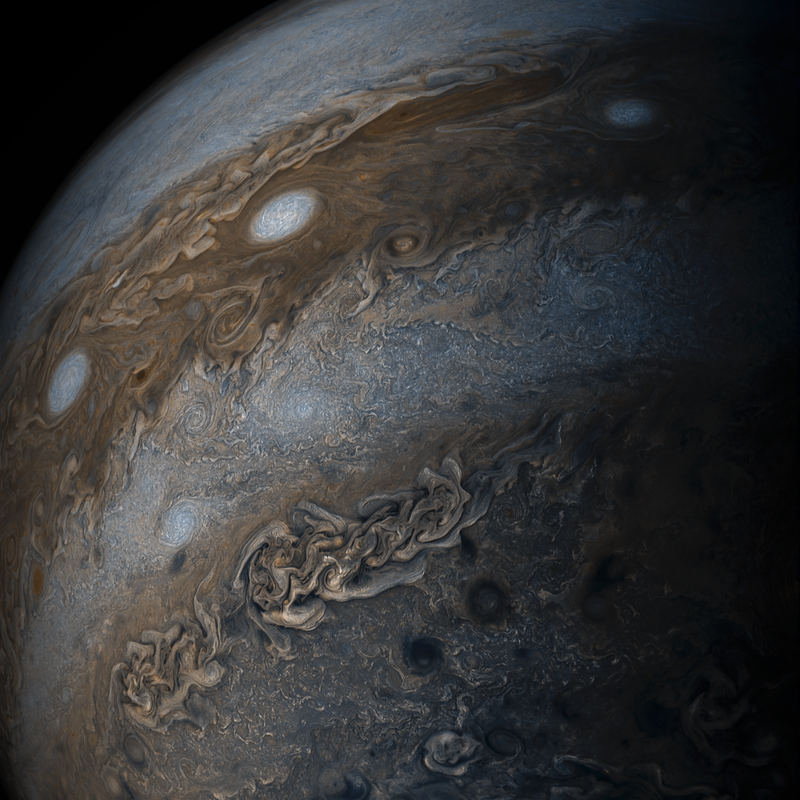 The camera is called JunoCam and was desgined specifically to create visible-spectrum color photos for the general public to download & process. 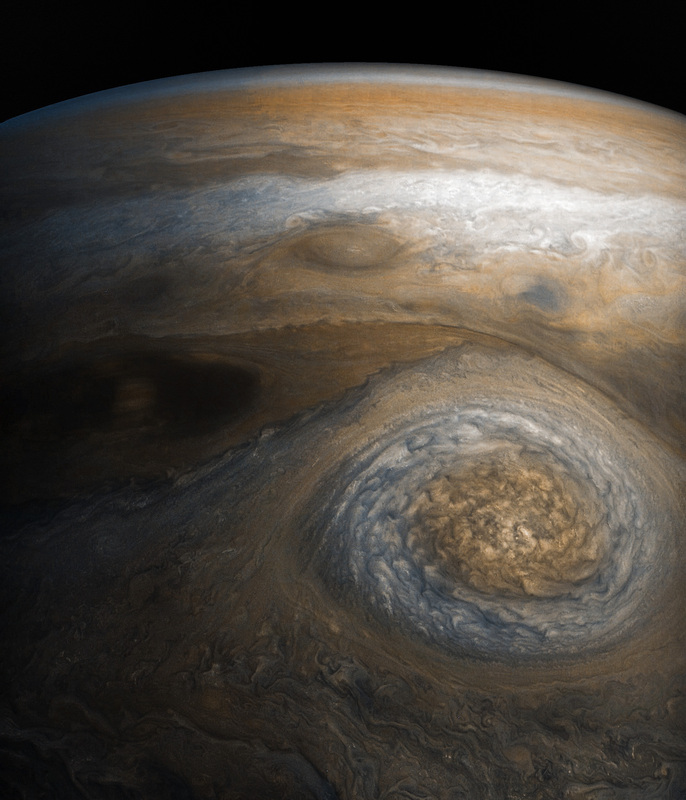 Folks will even have a say in which features of Jupiter's atmosphere JunoCam focuses on. Juno is in a highly elliptical orbit, allowing it to get very close to Jupiter for brief periods without being fried by the planet's magnetic & radiation fields. We should see detailed JunoCam pics starting late next month or in early September, after the orbiter's first science pass near the planet. Cool stuff, I gotta say. I watched the orbital insertion last night on NASA TV. Juno's real intent, however, is to see beneath the clouds. Something I don't think the ParticipantCam can do. America just keeps giving us these summer blockbusters. Last year, Pluto. A couple of years ago (also on the Fourth of July) Curiosity's Mars landing. Now, this. Yup, that's correct. JunoCam is a response to public interest and is also intended to encourage more of it. Juno's main purpose, though, is to gather info about Jupiter's atmosphere so we can better understand what's going on there. 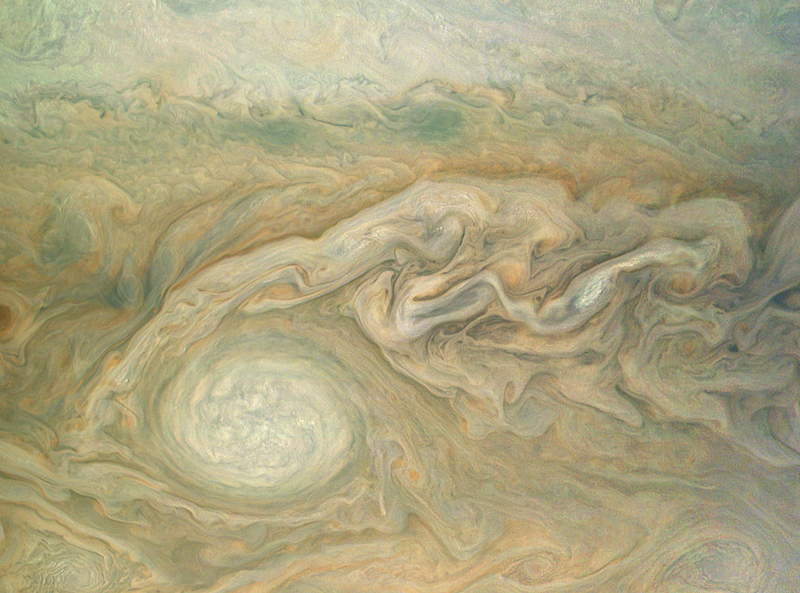 For example, is the Great Red Spot largely an upper atmospheric phenomenon or does it extend deep? If the latter, how deep? What elements & compounds is the GRS made of? What's happening at the planet's poles? That kind of stuff. Right now Saturn, Mars & Jupiter are all easily visible at night in the southeast to southwest sky. We've also got cameras on spacecraft orbiting all three. Definitely cool. The first cool Juno imagery is coming in. I've attached a photo, by JunoCam, of Jupiter's north pole. The Cassini orbiter took some similar pics years ago during its slingshot flyby en route to Saturn, but this one is looking straight down at the pole. Nifty! Lots more to come. What a time we live in. On the one hand there's amazing science and discovery and on the other Trump. Here's a JunoCam pic of what NASA is calling the "Little Red Spot" (not much red to be seen, but it is apparently a Red Spot-like formation), taken February 2nd during one of Juno's close approaches to Jupiter. I think I see a UHD 4K box in my future. The contrast here is jacked up a bit much for my taste, but the data is available for anyone to process per their own taste. Not a hospitable planet (unless you're a radiation-eating microbe who digs high velocity atmospheric turbulence)! Amazing photos and information, Dave!! Thanks for your posts. Incredible imagery. I think Jupiter is moving up abreast of Saturn as the most beautiful planet in the solar system. Looking forward to all the GRS info Juno's other instruments collected too! Here's the "North North Little Red Spot 1" from the most recent flyby. It's an anticyclone dating back to at least the early 1990s. The pic is "upside down": north at the bottom. Here's a corker from the latest Juno flyby a few days ago. Includes a storm (in the image's brightest area) the Juno folks are calling Hurricane Rachel. If I find a direct image link I'll put it here. Stunning. If you do find a hi res link, please do post it. My printer awaits.